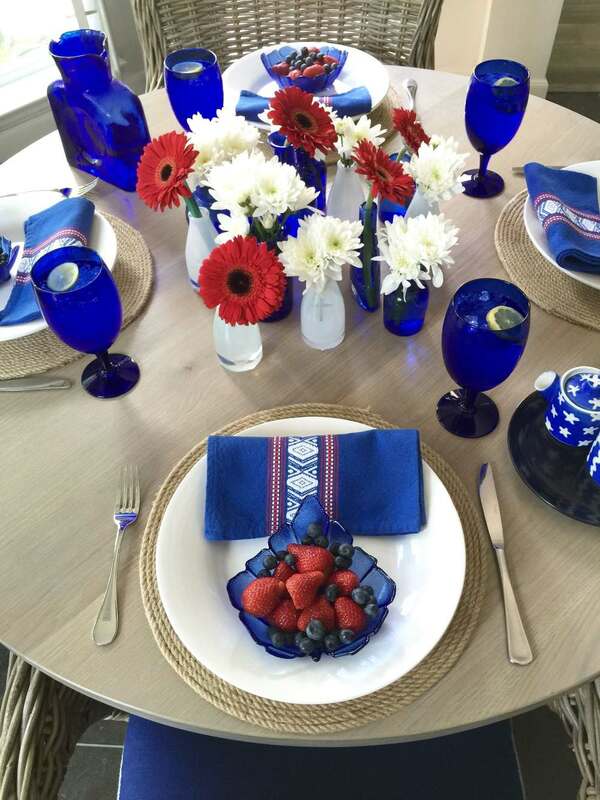 MUST-SEE: A Red, White & Cobalt Blue 4th of July Tabletop Design! This weekend we are hanging around the house and plan to get together with another neighbor-couple for dinner. And I’ve planned my table just in time to share with you before the weekend. My new breakfast table is wonderful! And because there’ll just be four of us, we’re going to sit here and enjoy the view of my garden. It’s beautiful to look at but HOT to sit in right now, so we’ll dine in the comfort of the A/C with the ambience of the outdoors and some red, white, and blue. Most of these items pictured here are in my collection of tableware. However, I did pick up some new simple white plates at our At Home store here in The Woodlands, along with some round rope placemats in a neutral to match my table top and wicker chairs. I’ve got another summer tabletop post coming up using these and more of their products that I’ll be sharing after the 4th. When we lived in Norway, we’d do trips down to Europe whenever possible. On one trip, we toured the Basque region of France with my in-laws (they had been before and knew their way around). I have lots of cobalt blue glassware (my favorite color), and this has to be the best time of year to use it! Oh, and my little sugar and creamer in blue stars and squiggly stripes was purchased from a ceramicist in Norway. I met her at an art fair, then took a trip out to her studio, outside Oslo, and selected just what I wanted from her collection. I have a teapot, coffee cups, and saucers, too. Little pieces of art that make me so happy to use. Have a great weekend! And stay safe! More red, white, and blue design inspiration!